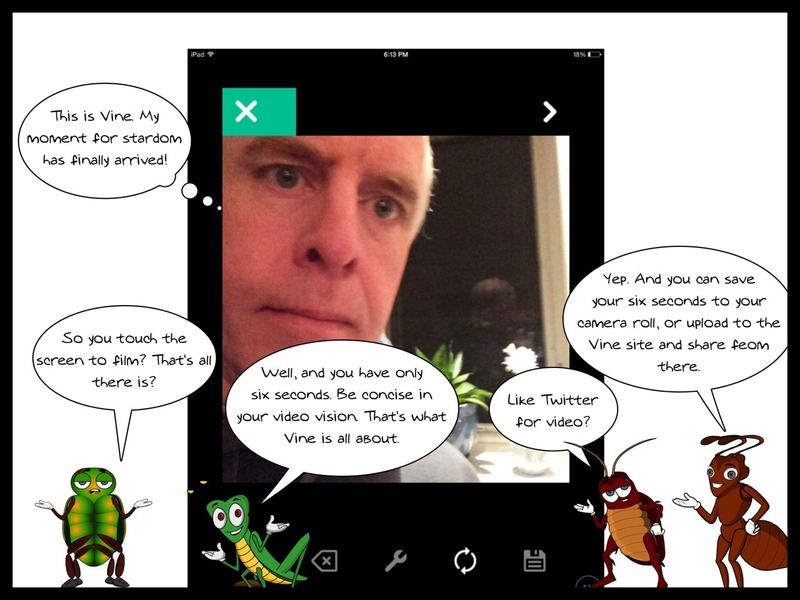 I am not a newcomer to using Vine, but I still wonder about how to best utilize the restraints of its six seconds. Here, I wrote a poem about Vine, recorded it in pieces in Vine and then used an app called PicPlayPost to coordinate the Vine videos together as a collage. I kept the poem rather simple. Four lines, two couplets. Each line had to be around six seconds long, of course, to fit into a single Vine post (I wonder what my Vine followers were thinking as I posted one after another.) I added a fifth intro video when I realized that the poem might need a little context. With Vine, your videos also get posted to your Camera Roll, which allows PicPlayPost app to access them for a multimedia collage. I really like PicPlayPost for the way it can use various media. As noted above, you can also sequence the playback of videos. I did it rather linearly here, but I didn’t have to. The shots themselves were simple, too. I did try to move the lens a bit for each of the posts, to give a bit of variety to the eye. As it is, the collage looks strange, with all of my faces looking at you. Sorry about that, but it will lay the grounds for a joke in my “how to” comic coming up for my Got Some ‘Splaining To Do Tumblr. This entry was posted in Movies, Poetry, Vine, YouShow. Bookmark the permalink. That is cool. Great idea. Love how the screen frame cuts off your eyebrows and becomes new unibrows! Would be so much fun to write a script and then go back and forth and combine. Blogging style question here: with the ease of highlight/right click search do we need to be hyperlinking within the post as much. I tend to over hyperlink because of experience with ADA and seeing impaired at uni level. Can we assume our reader can do the simple highlight and right click search function? I find that not to be the case for my university students.